Lanchester Wines, the UK wine distribution arm of the Lanchester group of companies, has launched a premium brand development business named Vintrigue. Specialising in connecting family-owned wineries with the UK market, Vintrigue’s mission is to identify premium, family-owned, wine producers and bring their wines to the UK consumer in eye-catching and relevant packaging..
On recognising this global trend, Lanchester Wines engaged with specialist branding agency Daemon and Genius, headed up by Catherine Monahan, to launch Vintrigue. Vintrigue combines leading wine sourcing, wine marketing and sales experts with consumer trend forecasters and brand developers to create a portfolio of wine brands specifically designed with consumers in mind. These new brands reflect the character of the new business and aim to bring excitement and adventure to the UK’s wine shelves and wine lists. The range compromises both still and sparkling wines. Ten Pound Poms: Ten pounds for a new life on the other side of the world! The original ‘Ten Pound Poms’ were tempted Down Under by the allure of a bargain boat ticket to a new life. Under the ‘Assisted Passage’ programme between 1946 and 1972, more than one million ‘Ten Pound Poms’ emigrated to Australia, paying a nominal £10 for the long sea voyage South. This brand is all about living life to the fullest, experiencing new things, new places and striving for the best – in oneself and in the quality of what one does and buys. With striking labels representative of the era, the range comprises: Currency Creek Cabernet Sauvignon 2014; Limestone Coast Chardonnay 2015 and Claire Valley Shiraz 2015. RRP £8.99-£9.99. The Speakeasy Club: The Speakeasy of the ‘Roaring Twenties’ was a place of whispered passwords and secret handshakes to get you into the underground world of illegal drinking dens where liquor, music and dancing ran in the face of Prohibition. We’re keeping that rule-breaking spirit alive, by bringing the consumer some of the best kept secrets from artisans, mixologists and winemakers the world over. The packaging design captures the flavour of the prohibition era, a vintage look of art deco fused with modern elements. The Cabernet launches our Speakeas y ‘poster girl’ whilst the Malbec label speaks of Buenos Aires’ underground Tango movement of the 1930’s. The wines comprise a range from premium, award-winning producers: Currency Creek Cabernet Sauvignon 2014; Malbec 2015 Proemio Vineyards, Mendoza; Barrel Fermented Chardonnay 2015 O’Neill Vintners, California; Pinot Noir 2015 O’Neill Vintners, California. RRP £7.99-£9.99. Quilimari – a range of wines based on the legend of Quilimari in Chile with strikingly beautiful and detailed labels telling the story of Quilimari and love lost: Syrah 2015; Chardonnay 2015; Sauvignon Blanc 2015. RRP £7.99. 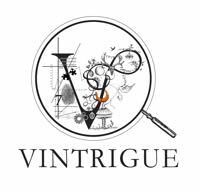 Vintrigue – a contemporary range of wines designed to fit the modern palate packaged in a brand that encapsulates everything Vintrigue stands for: White Zinfandel, California, and Moscato Colombard Riesling, California. Five businesses make up the Lanchester group of companies spanning different areas of expertise within the UK wine sector and its supporting industries – Lanchester Wines, Greencroft Bottling, Lanchester Gifts, Lanchester Energy and Lanchester Property.